The huge range of different series on offer by Amedia is somewhat mind-boggling. We don't quite know how you would get to hear enough of them to make informed decisions, but certainly this Old School set has whetted our appetite. Dark, dry, subtle, low volume and soulful. The prices are competitive with other small quality brands like TRX and Dream. It's just a pity we didn't get more cymbals to test! There seems to be a small but vigorous population of traditionally-trained cymbalsmiths in Istanbul which every few years launches a new name onto the market. 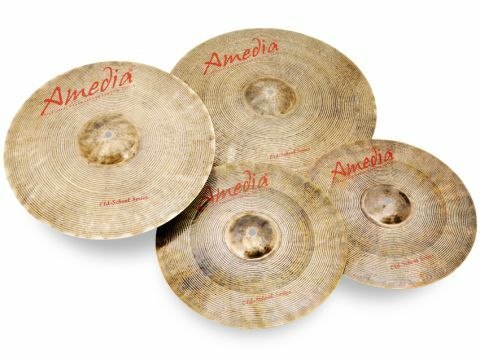 Amedia was established in 2005 as a family company to produce cymbals in the age-old way. With a small factory in the centre of Istanbul owned by Ahmet Baykusak, himself a cymbal hammerer with 15 years' experience, production is under the watchful eye of the Zilcan (Zildjian)-trained Eremya Arzat, who has trained many Turkish cymbalsmiths over the past 28 years. For a young company we've never seen so many different series of cymbals - we counted 22 on the website. No, really, 22. Not only that, but Amedia offers a massive range of sizes and weights in any of the series, which makes Amedia potentially the most diverse company of them all. "There is a large and increasing constituency of drummers who want the traditional dark and dry sound." Amedia is new to the British market and is distributed by Handmade Cymbals over here. Handmade's intention is to offer "exceptional products at competitive prices". Old School is one of the most recent of Amedia's many series. The first thing is that all Amedia cymbals are hand-crafted from cast B20 bronze in the traditional style which has been synonymous with Istanbul over the past century and has roots going back at least to the founding of Zildjian in 1623. The Turkish K Zildjian is the prototype on which jazz was founded. The transplanting of Zildjian to America opened up the path of the modern cymbal's colossal evolution, but there is a large and increasing constituency of drummers who want the traditional dark and dry sound. Old School aims to provide that. The cymbals look most distinctive - a rich coffee brown with raw hammered, leopard spot bells and thickly grooved upper and lower surfaces. Amedia says the colour is due to the Old School's unique, secret, alloy. The blood red logo and denomination add to the distinctive look. There are no computer-guided lasers involved in the rolling, just the experience of Eremya Arzat. Each cymbal is handhammered on an anvil at least 5,000 times. A supplemental knurling process creates the unique finish. The tone grooves are cut into the top and underside by a skilled lathe-man, again working entirely by hand and eye. A second lathing is followed by a hand polish before leaving the cymbal to cool for several days. Finally each cymbal is played (and signed) by Ahmet Baykusak before leaving the factory. Old School are certainly traditional sounding - deep, warm and dry. Although we only got a minimal set to review, the 19" ride, 16" crash and 14" hats sat together perfectly well. At 19" the ride has the expected compact sound. The stick response is clear and articulate but surprisingly thick and dark. There is little spread and the cymbal cries out for crash-riding in a stick-tip-to-shoulder style. The crash sound itself is short and does not interfere with the ride pattern. There's no build up of hum or unleashing of unpleasant overtones, the cymbal remains dry and focused with a rich and chocolaty overall timbre. The unlathed bell compliments with its slightly mysterious, almost woody ping - there's nothing at all tinkly or cheap about it. The dry quality is even more noticeable with the medium-thin 16" crash. Being quite small again, the attack is moderate, not aggressive, while the sustain is brief. Don't expect a lot of power or projection - none of these cymbals is about brawn, they are all about subtlety and deep, purposeful groove. Although small you could easily ride the 16", preferably with a fairly light stick. With a 19" ride and 16" crash, the 14" hats could overpower the set and we'd have liked to try a 13" pair. Still, since the 14s are, like the other cymbals, measured and orderly, they are not too overbearing. Stamped 'Regular' they're medium-heavy, the bottom hat being heavier and thus higher pitched than the top. But they still manage to be seriously deep-pitched, so there are no disagreeable overtones when you half-open and thrash them. Just driving, thick and mellifluous fours. Closed, eighth note ticks are broad and warm - even a small-beaded stick gives you a velvety sound. The shouldered 'shoop' is clean and bright relative to the lower closed sound. Like the other cymbals, don't expect a great deal of cut in a live, un-miked situation. None of this set is brash, they don't have the shrill projection of some modern heavy cymbals, but they are perfect for old-school grooving in the Al Jackson to Steve Jordan mould.